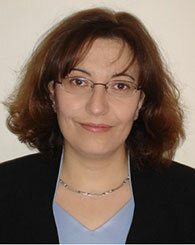 Grace Dagher is an Associate Professor of Management at Adnan Kassar School of Business. She holds a PhD in Business Administration from the University of Texas-Pan America, an MBA from the Lebanese American University and a BA in the same discipline from Middle East University. Her research interests focus on topics such as employee engagement, emotional intelligence and cross-cultural adjustment. Presented at the “Research and Teaching Collaborations with Colleagues in Underrepresented Nations” workshop session at the Academy of Management conference in Boston, on August 4, 2012. 1999-2000 Research Assistant-Tourism Industry in Lebanon Sponsored by USAID. Dagher, G. K., Chapa, O & Junaid, N. (2015). The historical evolution of employee engagement and self-efficacy constructs. Journal of Management History, 21(2), 232 – 256. Dagher, G. K, & Itani, O.S (2014). Factors influencing green purchasing behaviour: Empirical evidence from the Lebanese consumers”. Journal of Consumer Behaviour, 13(3), 188-195.